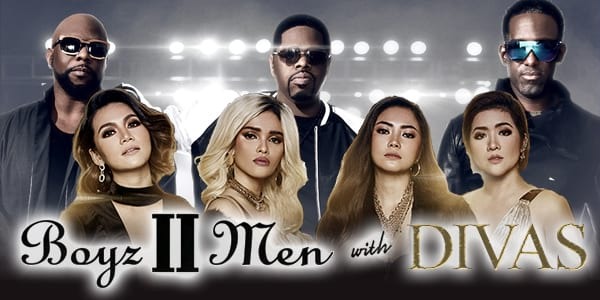 Boyz II Men Excited to Perform with Divas and Visit Davao For The First Time! Best-selling R&B group of all time, BOYZ II MEN is coming back to the Philippines! The group is set to perform in DAVAO for the first time on Thursday, December 13th at SMX Convention Center, SM Lanang Premier. 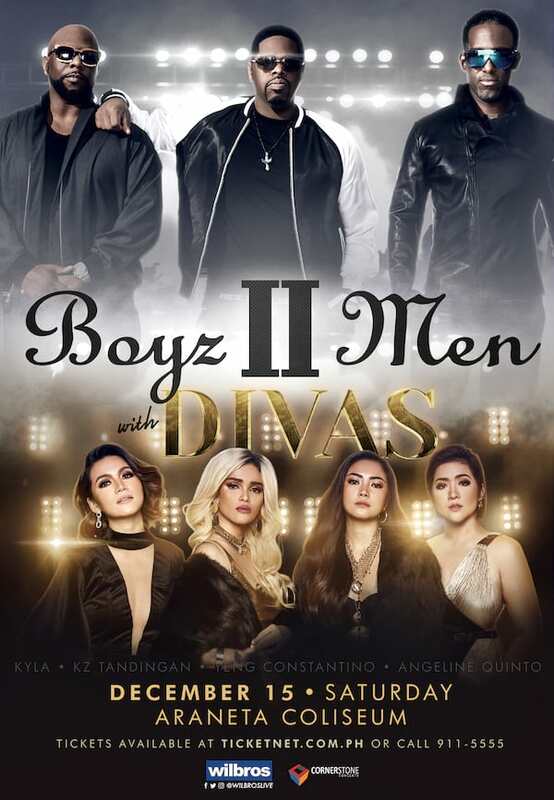 They will also bring their grand show to MANILA Back-to-Back with power vocal tandem, DIVAS — comprised of KZ Tandingan, Yeng Constantino, Kyla and Angeline Quinto for a concert on Saturday, December 15th at the Araneta Coliseum. Boyz II Men continues to tour globally, while also starring on their own residency at The Mirage in Las Vegas through 2019. Fall this year, they toured across America as special guests for Bruno Mars’ “24K Magic World Tour” with Charlie Wilson, Ciara and singer Ella Mai. In an exclusive interview, the Boyz share their passion in touring stating “...the fact that we still get to do what we love to do after 17 years, that's fulfilling for us.” They are set to share the stage with the Philippines’ DIVAS in Manila. They will also perform in Davao for the first time, and they are “...excited, and everytime we come to a place and we see the new talent... Actually, that puts us a little bit deeper into the culture because we get the chance to perform with the Philippines' hottest girl group. And you'll never know what comes out of it." Consisting the all-star female DIVAS collaboration is Asia’s Soul Supreme, KZ Tandingan, Pop Rock superstar Yeng Constantino, R&B Queen Kyla, and Queen of Themesongs, Angeline Quinto. These four talented and empowered DIVAS equally hold numerous awards and hits to their name, making them renowned and respected songstresses in the Philippines. Best known for their emotional ballads and acapella harmonies, Boyz II Men is comprised of Nathan Morris, Wanya Morris and Shawn Stockman. The group’s biggest and most requested hits include “End of the Road”, “I’ll Make Love To You”, “On Bended Knee”, “Water Runs Dry”, “4 Seasons of Loneliness”, “Motownphilly”, “In The Still of the Nite (I’ll Remember)”, “It’s So Hard To Say Goodbye To Yesterday” and “One Sweet Day” with Mariah Carey – which still holds the record of the longest running Billboard Hot #1 song, staying at the top for 16 weeks. The legendary group holds four Grammy Awards, nine American Music Awards, nine Soul Train Awards, three Billboard Awards, and a star at the Hollywood Walk of Fame. BOYZ II MEN with DIVAS: Live in Concert is presented by Wilbros Live and Cornerstone Concerts. Tickets are now on-sale at TicketNet.com.ph or call +632-911-5555 for more details. For Boyz II Men Live in Davao tickets, visit SMTickets.com or call +632-470-2222. The Back-to-Back Concert of the Year. The best-selling R&B group of all time, Boyz II Men, is coming back to Manila for a one-night concert on Saturday, December 15th at the Araneta Coliseum, together with the DIVAS. Boyz II Men is Set to Return in Manila This December! American Boy Band, Backstreet Boys, is coming back to Manila this October!